On July 10th, 2017, Iraqi authorities announced full control over Mosul, the largest city conquered by the so-called Islamic State (Daesh). This is not the end of the war between the Iraqi government forces and Daesh, but it has limited the scope of the organization’s control in Iraq to three unconnected areas (Tal Afar in the Nineveh Governorate, Hawija in the Kirkuk province and Al-Kaim and Anah in the western part of Al-Anbar province). In addition, these are peripheral areas, inhabited by 3-4% of the Iraqi population (according to the pre-war statistics) and the lack of control over these areas does not substantially affect the effective functioning of the Iraqi state. Regaining control of the vast majority of Iraq’s territory by the Iraqi authorities has distanced the perspective of its disintegration, and the only uncertainty now is the possible secession of the Kurdistan Region. The concept of the so-called ‘Sunniland’ (a theoretical state to be created by secession of the Sunni provinces of Iraq) or the annexation of part of the territory of the Nineveh province by Turkey cannot be taken seriously in the present state of affairs. The situation may change however, if the stabilization process is not successful and mass fighting resumes. In this context, it should be kept in mind that in 2008, the relative stabilization of Iraq was achieved as a result of the pacification of Al-Qaeda’s partisan-terrorist activity in the Al-Anbar province by the so-called Sunni Awakening (Arabic: sahwa), i.e. the activation of tribes, and the abolition of the Shia Mahdi Army. The later sectarian policy of Prime Minister Nouri al-Maliki, which intensified after the withdrawal of American forces from Iraq in 2010-2011, led to further destabilization and Daesh’s success. This scenario can be repeated but does not have to. In Iraq the potential for conflict and destabilization are determined by the following aspects: sectarian, ethnic, tribal, and political. Out of these areas, only the sectarian aspect (in the Shiite-Sunni sense) and the ethnic one (restricted to the Arab-Kurdish dimension) are of interest to the international mass media. Meanwhile, the demographic composition of Iraq is much more complex. In the coming year, a number of political events will also be taking place in Iraq which may have a positive or negative impact on the stabilization process. This includes, in particular, the planned referendum on independence in the Kurdistan Region on September 25th (which also includes the so-called disputed territories), the November 6th parliamentary elections in the Kurdistan Region, and the elections to the Iraqi parliamentary and provincial councils scheduled initially for April, 2018. The legal regulation and its implementation regarding the political and military role of the tribes, as well as the future of the Popular Mobilization Forces (Al-Hashd Al-Sha’abi), will also play an important role. According to the constitution from 2005, Iraq is a country in which Arabs and Kurds are two equal dominant ethnic groups, and the Kurdish language has an equal status in relation to Arabic. This means that Kurds are not formally considered a national minority in Iraq. Arabs account for about 75% of Iraqi residents and Kurds about 20%. The remaining 5% are national minorities. The constitution identifies three minority groups whose languages are granted special rights: the Assyrians, Armenians and Turkmen. The law also guarantees the ethnic group of the Shabak people a place in the parliament. The vast majority of people belonging to these minorities live in the so-called disputed areas, also called Article 140 areas (this is a reference to the last article of the Iraqi constitution, which says that a referendum was to be held in some areas to determine their possible accession to the Kurdistan Region). The disputed areas include a large part of Nineveh (Shengal and the Plain of Nineveh) provinces, the Kirkuk Province and Tuz Khurmatu in Salah ad-Din province and Khanaqin in Diyala province. After 2014 they have been almost entirely under the control of the Peshmerga tribe (Kurdish forces with the status of the Iraqi army in the Kurdistan Region). The vast majority of Kurds live in the Kurdistan Region or in disputed territories; however the Kurdistan Region, despite popular belief, has no autonomy (this form is not provided for in the constitution), but is the second federal level (the first one are the provinces), to which the constitution grants certain competences similar to an autonomy. Theoretically, other provinces (e.g. Sunni ones) may also form regions, although due to procedural restrictions this has not occurred. Still, there is no procedure to grant autonomy to Turkmen or Assyrians. The Kurdistan region is home to almost 6 million people, where 5.5 million are Kurds, and the remaining 0.5 million are national minorities: the Assyrians, Turkmens and a small group of Armenians. These minorities are guaranteed 11 seats in the parliament of the Kurdistan Region, of which there are five for Turkmen and Assyrians and one for Armenians. This is a completely different approach to what can be seen in the Iraqi Parliament, where in general seats are reserved for religious minorities (Christians, Yazidis and Mandalians). This is significant because of the lack of representation of the Shabak or the Yazidis in the Kurdish parliament whom Kurds do not recognize as distinct ethnic groups. The actual control that the Kurds have over controversial territories, especially the Plain of Nineveh and the Shengal district, and the majority of Kirkuk and Tuz Khurmatu, complicates the situation because of the great ethnic diversity there. In spite of the actual control that the Kurds have over these areas, it is not planned to carry out the Kurdish parliamentary elections in these areas. This, in turn, limits the influence of the inhabitants over the choice of organs effectively exercising their authority. More importantly, here we are looking at ethnic and religious minorities who might feel underrepresented (at least some of their representatives). The referendum on independence, scheduled for September 25, which will take place both in the Kurdistan Region and in the disputed territories, is intended not only to show the will of the people in relation to independence, but also to fulfill the role of the referendum provided for in Article 140 of the Iraqi constitution, that is to legalize the annexation of these areas to the Kurdistan Region. The problem is that it is not distinctly referred to in the referendum question, and will not be treated as such by the Baghdad authorities which consider the whole project illegal. However, no consequences from Baghdad against the Kurdistan Region is to be expected, especially since the Kurdish authorities have already announced that this will not mean automatic proclamation of independence. The question of the result of the referendum on the status of the disputed areas is much more complex. In particular, clashes in these areas between Peshmerga and the Shiite Al-Hashd Al-Sha’abi groups cannot be ruled out. In Tuz Khurmatu such fights, though on a limited scale, have already taken place. The issue of the referendum on independence is linked to the problem of the new status of the two Iraqi provinces: Kirkuk and Nineveh. In the case of the former, it is the only province in Iraq that does not have provincial council elections (except in 2005), which is related to fear of showing actual ethnic proportions between the three main groups inhabiting this province: the Kurds, Turkmen and Arabs. It is unclear whether the provincial elections in 2018 will take place here or not. The authorities of the province insist on carrying out the elections, while the Iraqi government has suggested cancelling them. The situation is further complicated by the fact that the Hawi district belongs to this province, is inhabited almost exclusively by the Sunni Arabs and is still in the hands of Daesh, where most Kurds are seeking to join Kirkuk to the Kurdistan Region, excluding this district. The issue of the province of Nineveh is even more complex, as there are four overlapping problems: ethnic, sectarian, tribal, and military. In terms of this last aspect, it is about Daesh’s continued occupation of the Tal Afar district and the presence of other military structures. Tal Afar is a district inhabited by the Turkmen minority, with around 300,000 residents living there in 2014. They were both Shiites and Sunni (in roughly equal proportion), but after the occupation of this area by Daesh the Shia were exiled or murdered. Some estimates say that the population that remained in Tal Afar is only around 10,000 people. 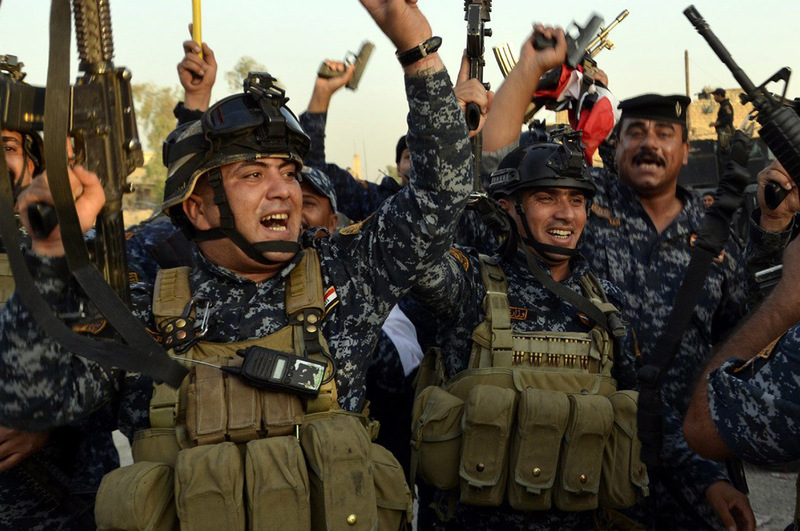 After Daesh’s elimination from Mosul, the enclave has declared ‘independence’. Since November 2016, Shiite Al-Hashd Al-Sha’abi have been just a few kilometers from the city of Tal Afar, with a significant portion of them being Shiite Turkmen exiled from this city and Turkmeni-Shiites from Kirkuk. Turkey, considering itself a Turkmen protector in Iraq, has opposed the participation of Al-Hashd Al-Sha’abi, including its Turkmen component, in the attack on Tal Afar. In practice, however, it is only about the Sunni-Turkmen (represented by the Iraqi Turkmen Front), as the majority of the Shiite Turkmen have a negative attitude to the Turkish authorities and their presence in Iraq. Turkish troops are still stationed at the Bashiqa base (something opposed by the Iraqi authorities) and are located in the disputed area controlled by the Kurds. Prior to the take-over of Mosul by the government forces there had been a real fear that Turkey could intervene on a larger scale and take control of the Tal Afar district under the pretext of defending the Turkmen people from Shiite militias. At present, however, the probability of such a move is already very small, which, in turn, increases the likelihood of Al-Hashd Al-Sha’abi’s participation in the attack on Tal Afar. One cannot rule out retaliatory measures in this city, and certainly the Shiite Turkmen troops will strive to take over the military control of the city after its liberation. This situation, however, will have a limited impact on the Sunni-Shiite relations within the Arab ethnic majority. In addition to Daesh and the Turkish army, as well as the Iraqi government (army, police and special forces) and U.S. forces supporting the Iraqi government, there are still the following groups on the Nineveh province territories: the Kurdish Peshmerga – the so-called Peshmerga-Rojava (Syrian Kurdish troops subordinate to Peshmerga), Al-Hashd Al-Sha’abi (formally being a part of the Iraqi armed forces), PKK (Kurdistan Workers Party), Yazidis (divided into three groups: pro-government, Peshmerga and related to the PKK) and Christian groups (part of them connected with the Iraqi army and Al-Hashd Al-Sha’abi, and part of them with Peshmerga) as well as the Sunni tribes of al-Hasheed al-Ashari (cooperating with the Iraqi army and Al-Hashd Al-Sha’abi) and the Sunni pro-Turkish troops Hars al-Nineveh, of the former Governor of Nineveh Atheel Al-Nujaifi. The presence of the PKK in the Nineveh Province also complicates the situation, due to Turkey’s opposition and the threat of armed intervention, as well as because of military incidents that occur between the PKK and Peshmerga troops. The decision of the future of the Nineveh Province, and especially of Mosul, will be crucial to prevent the renewal of the Shiite-Sunni sectarian fights. The war against Daesh has, however, strengthened the sense of community over religious affiliations, although there is still some potential for support among the Sunnis for Daesh or post-Saddam terrorist structures such as the Naqshbandi Order. The latter organization, headed by Saddam Hussein’s number 2, Izzat al-Douri, has already announced that it will move to terrorist activity after Daesh has been defeated by the government forces. The Sunni-Shia relations within the Arab majority also depend on the attitude of the neighboring countries and the role of tribes. In early 2017 the Iraqi parliament passed a controversial law on tribes that strengthened their political and military role. On the one hand, it weakened the effectiveness of state structures, but on the other hand it offered the chance that the Sunni tribes in their own interest would defeat the terrorist activity of quiescent Daesh, Al Qaeda or the Naqshbandi Order cells. The influence of the tribes on the inhabitants of Mosul itself is limited, and partial control of this Sunni city is also exercised by the Shiite Al-Hashd Al-Sha’abi units, which may lead to sectarian tensions. Good relations between Al-Hashd Al-Sha’abi and the Sunni tribes may not be enough to prevent such a scenario. One of the most prominent Iraqi intellectuals of the twentieth century, Ali Al-Wardi, perceived the Iraqi reality as a permanent rivalry, and at the same time a symbiosis between a province dominated by tribes and a city based on state structures. Therefore, in much less urbanized Al-Anbar tribal influences may have a greater stabilizing effect. The political platform for potential destabilization is connected primarily with the intervention of neighboring states: on the one hand, the influence of Saudi Arabia and Turkey (to a lesser degree) on the Sunnis and, on the other, Iran on the Shiites. Most Iraqi Shiites, however, want good Iraqi-Iranian relations, but they oppose Iran’s excessive influence in Iraq. The problem, however, is that some of the Al-Hashd Al-Sha’abi troops are under strong Iranian influence. In addition, these units want to create a parallel military structure in Iraq, modeled on the Iranian Pasdaran. Not only the Sunnis, but also the majority of Shiites do not consent to this, including the Shiite religious authorities in Iraq, as well as the cleric Muqtada al-Sadr who has a large impact on the lower social classes among the Shiites. In this context next year’s elections will be significant. The main rivalry will be held between Nouri al-Maliki’s block, supported by the pro-Iranian Al-Hashd Al-Sha’abi troops and the Muqtada Al-Sadr block, who has tried to create a trans-sectarian coalition with secularist groups. Any possible victory of Nouri al-Maliki may halt the process of stabilization and consensus above religious divisions. Not without significance is the fact that the Yazidis and Assyrians (Christians) have their own political demands for granting them autonomy and for the creation of a separate province for them, for example within the Kurdistan Region or, as it has been called for by some Sunnis, within the Nineveh Region (consisting of five provinces: Yazidis province, Shingal, Turkmen Tal Afar, Assyrian Plain of Nineveh, Mosul and Arab-Sunni remaining territories). As the areas inhabited by these groups are divided between those controlled by the government and the Kurds, they are an object of rivalry between Erbil and Baghdad, making it difficult for them to return to the areas where Daesh was defeated a few months ago. 1. The Sunni part of the Iraqi population is not currently interested in building a separate state entity called ‘Sunniland’. Such a creation would be economically and politically weak, ruined by war and shaken by internal conflicts of ethnic, regional and tribal nature. The Sunni Arab states of the region are also not interested in the secession of ‘Sunniland’. In particular, Saudi Arabia is aware that this would mean a total loss of influence on decisions made in Baghdad, which would then be fully dependent on Iran. In addition, ‘Sunniland’ would be an economic burden for the states of the Arabian Peninsula, and indirectly for the entire international community. The total chaos and tribal struggles similar to those of South Sudan would also be very likely. The international community, in particular the European Union, should abandon thinking in simplified sectarian terms and recognize the concept of ‘Sunniland’ as an artificial one based on western perception. 2. The Sunni Arab population in Iraq accounts for about 20% of the local population; however, it has no uniform interests. Much belongs to tribes, which also have Shiite branches (e.g. Jubur), which limits the importance of the sectarian divisions. Tribes in individual provinces are primarily interested in the situation in their own territory, rather than the formation of a union of provinces based on a sectarian criterion. A very important aspect here is the proper balance between the role of tribes and the structures of the state. International forces, engaged politically or militarily in the stabilization of Iraq, should treat tribal leaders as important partners in this process. 3. The relationship between the Kurdistan Region and the rest of Iraq is very weak, and peaceful separation could have a positive effect on both sides. The Kurds have played an obstructive role in attempting to move away from the approach of granting federal political positions according to the ethnic-sectarian parity (muhasasa system). Kurdistan’s secession would allow political reform in Iraq and would not increase the likelihood of secession of the ‘Sunniland’. But if the secession is held without an agreement with the Iraqi government, it will have a negative impact on both sides. Therefore, the international community should support the negotiations between the Kurds and Iraq in order to find an optimal solution for both sides. The key problem here are the disputed areas, especially Kirkuk and parts of Nineveh Province. These areas need to be granted a special status, regardless of whether the secession of Kurdistan happens or not (and whether they become part of Kurdistan Region or not). Otherwise, the probability of fights and terrorist activity in these areas will be very high. This will also have a stimulating impact on the exodus of Christians, as well as, to a lesser extent, the Yazidis and the Shabak people. 4. Changes in ethnic-sectarian geography (ethnic cleansing and the reaction to it) have been ongoing since the 1970’s; therefore, it is not possible to expect a complete reinstatement of ethnic and religious composition back from 2014, and the international community should not insist on it. It is not always possible for the tribes (or their parts), responsible for crimes committed on other ethno-sectarian groups, to remain in the areas they have inhabited, as this would prevent the return of groups that had been victims of their persecution (mainly in the provinces of Niveneh and Diyala). This mostly concerns Christians, Yazidis, Turkmen and Shabak people, and these groups should be guaranteed safe return to their homes. However, there are serious doubts about whether this will be possible without the introduction of UN peacekeepers into the area (Nineveh Plain and Shengal). It would also be useful to consider the dislocation of such units in the city of Mosul. In addition, international commitment to training of stabilization forces should be increased. As of June 2016, Polish troops have served in this capacity in Iraq and this mission should last as long as it is needed, and if necessary, Polish involvement should be increased. However, the involvement of other states in combat missions is not recommended (except for air support). Non-Iraqi forces who do not conduct training missions on the basis of a mandate from the Iraqi authorities or stabilization missions under the UN mandate should also be withdrawn from the Iraqi territory. This is especially true of the PKK, the Turkish army and the Iranian forces. All other sectarian or ethnic forces, except Peshmerga and tribal troops operating under the tribal law, should be dissolved or integrated into the army or the federal police. The international community should also step up pressure on other countries in the region (primarily Turkey, Saudi Arabia, Iran and Qatar) to stop them from interfering in Iraq’s internal affairs. 5. It should be kept in mind that at least a few thousand Iraqi citizens as well as other nationals have been involved in the crimes committed in Iraq since 2014. Iraq has the right to punish such persons, with measures including the death sentence. The international community, and the European Union in particular, should not interfere with the punishment of criminals, but instead exert pressure on Iraq to adhere to the principles of fair trial, and not to resort to torture. It is also important that all those guilty of abuse against prisoners or civilians in the areas liberated from the occupation of Daesh are held responsible. 6. The political process in Iraq should be supported by democratic countries, in particular the European Union, including Poland. This includes control of this year’s elections in Kurdistan and next year’s parliamentary and provincial elections. International engagement in interreligious and interethnic dialogue should be increased, and involve Iraqi organizations and representatives of the various religious and ethnic groups in the country. ANALYSIS: Financing purchases in the Polish Armed Forces - creative accounting?